Sci-fi horror is undoubtedly one of the most interesting genres in cinema. It’s no wonder that so many filmmakers and cinema enthusiasts have so much love for the genre. Sci-fi at its heart is already quite spooky; the fundamental fear of the unknown, people’s willingness to explore things that they don’t quite understand. Therefore, combining sci-fi with horror was a no-brainer. Filmmakers such as David Cronenberg, Ridley Scott, John Carpenter and Philip Kaufman took what forefathers of the genre such as James Whale (Frankenstein and The Invisible Man) started, and used their unique skills to captivate, frighten and delight audiences the world over with their wonderfully imaginative, clever, and often gory, works. Many might call the films in this list modern masterpieces, as the genre is still a relatively young one. Yet it’s a genre that is always expanding, learning, innovating and developing, much like science itself. Plan 9 from Outer Space is terrible. Edward D. Wood Jr. was famous in Hollywood for making utterly awful films, however they did have one thing going for them, they had heart. Say anything you want about Edward Wood’s lack of directorial flair, or his inability to write meaningful dialogue, the man had heart, and so did his films. His films were earnest and heartfelt, which demonstrated a real love for the art of filmmaking, which is probably why his films are still talked about today. His back catalogue has some true stinkers, yet they succeeded in attaining what other filmmakers can only dream of: cult status. 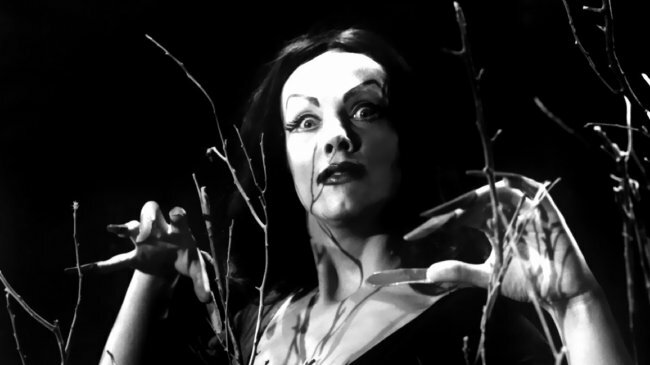 Plan 9 from Outer Space’s plot is a hard one to follow. The film starts off in a graveyard in California’s San Fernando Valley, and then come the aliens, in their somewhat clunky flying saucers on strings. These aliens intend to conquer Earth by resurrecting corpses in a Hollywood cemetery. They end up resurrecting an odd bunch of people: a cape-wearing ghoul (Bela Lugosi), a vampire (Vampira) and a heavy-set Inspector (Tor Johnson). Somehow the aliens hope to use these individuals, who are hardly The Avengers, to stop the human race from discovering and harnessing the true power of the sun. As you can tell by that plot synopsis, the film certainly lacks a coherent narrative. However, despite being known as one of the worst films of all time, Wood’s very early sci-fi horror is still a fan favourite to this day. It has that ‘it’s so bad it’s good’ quality. The acting brings to mind children in a school play, the special effects are cheap and unconvincing, the script is painfully poor, the set design is appalling and the score is headache inducing. However it is worth watching, much like Tommy Wiseau’s misguided masterpiece The Room, just because it’s so hilariously bad. One interesting piece of trivia linked to this film is that Mel Gibson wears a mask of Tor Johnson’s face in the very first Mad Max film. If Edward D. Wood Jr. did anything for cinema, he gave us those interesting few seconds of film. Don’t worry, the other films on this list are actually very good. Any film based upon a book called The Space Vampires has to be worth your time. Based on the novel by British author Colin Wilson, Lifeforce takes place sometime in the distant future. Things start to go wrong when, whilst on a mission to investigate Halley’s Comet, British and American astronauts encounter a strange alien craft. After boarding this space vessel they discover three naked humanoid beings, one female and two male, enclosed in what look like glass cases. Gripped by an unseen power, Air Force Colonel Thomas Wolfe Carlsen (Steve Railsback) decides to load these beings on board their very own space craft and bring them back to earth. Cut to London: Mission Control loses contact with the shuttle and a rescue mission is launched to investigate. They discover that the shuttle has been burned from the inside. The only survivors seem to be the three being salvaged from the alien space craft. However, when they get back to earth, things start to go horribly wrong. Lifeforce isn’t what one would call a masterpiece, however, it does have a lot going for it. Firstly the central premise is an interesting one, changing the old, and frankly slightly rehashed vampire story and making them come from the darkness of space certainly adds an extra edge to the blood-sucking mythology. The vampires themselves are also very different, in a good way. Instead of sucking your blood, they feed on your “life-force” (hence the title). Yet keeping the original title of the source material would have been more fun. The performances are solid. Steve Railsback gives a fine performance as the slightly disorientated Colonel, who shares a ‘special bond’ with the female vampire. Yet the film’s stand out performance has to be the female vampire herself, the two male vampires don’t really feature that prominently in the story. Played by French actress Mathilda May, she is able to deliver a remarkable performance despite saying very little. She is oddly sinister whilst being incredibly alluring at the same time. One could easily see oneself being completely captivated with the beautiful creature she is portraying. Spooks veteran Peter Firth also delivers a fine performance as the SAS Col. Colin Caine, as does Frank Finlay as Dr. Hans Fallada, who is the only person who really understands what’s going on. Yet the real highlight of the film has to be a kiss between none other than Professor X himself, Patrick Stewart, and Steve Railsback. 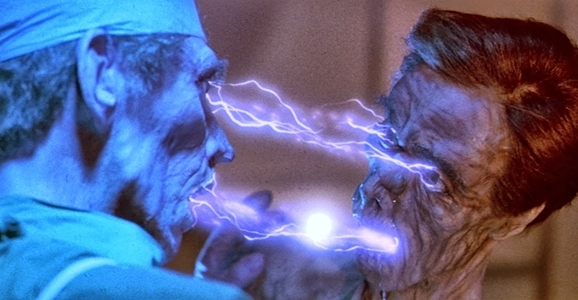 Lifeforce is definitely worth a watch for this moment alone. A film by Paul W.S. Anderson which is actually quite good! I know, you think I’m joking, but I’m being deadly serious. 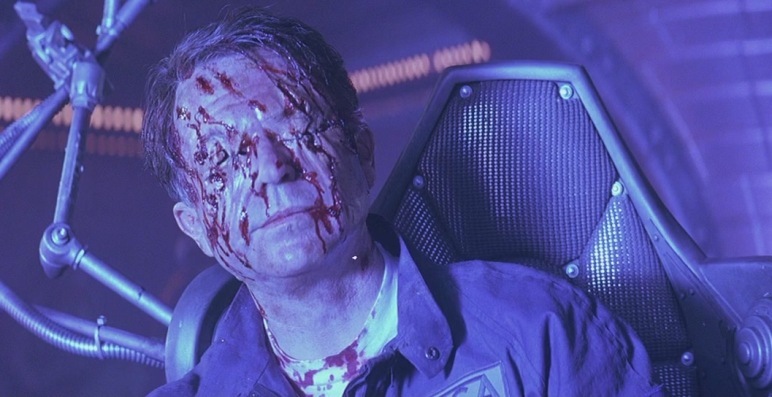 Event Horizon is a very good, interesting and thought-provoking film. Before the onslaught of the Residence Evil films we have come to expect from the British director, he made Event Horizon. It follows the story of a rescue crew who go on a mission to find and investigate a spaceship that had disappeared into a black hole and has now resurfaced. However it would appear that the spaceship has returned with someone or something new on-board. Firstly, the cast, Event Horizon has a stellar cast, with the likes of Laurence Fishburne as Captain Miller, Sam Neill as Dr. William Weir and the UK’s very own Jason Isaacs as the simply named D.J. The interplay between Laurence Fishburne’s Miller and Sam Neill’s William Weir is utterly absorbing. Both play off one another perfectly, demonstrating what it’s like to descend slowly into utter madness, or what could be described as some sort of demonic possession. Many scenes evoke Clive Barker’s Hellraiser, which is a good thing, it could be described as Hellraiser in space. Paul W.S. Anderson displays a certain visual flare which is greatly lacking in many of his subsequent films. Maybe doing something on a smaller scale benefits his directing style; less is often more. Yet, even so, he is still able to run wild with Philip Eisner’s script and made an impressively chilling sci-fi horror flick, which will stay in your mind long after the film has ended. As a child Cube scared the living daylights out of me, and upon reviewing it, it’s easy to see why. The idea of waking up in a strange and unfamiliar box, filled with the deadliest of traps, and having to find your way from box to box without dying is simply terrifying. That’s the gist of the plot. Seven complete strangers find themselves involuntarily trapped in an endless maze of interconnecting boxes, containing deadly traps. They have to work together in order to find their way out of the maze, if there even is one. The tag line of the movie was, ‘fear, paranoia, suspicion, desperation’. This sums up Vincenzo Natali’s twisted movie perfectly. Each character goes through these exact emotions and it’s not difficult to understand why. The idea of putting people into life-or-death situations, and observing them, much like a scientist would observe rats in a maze, is a terrifying idea, one which was later used in horror franchises such as the Saw films. It’s no wonder that Cube has become such a horror fan favourite and subsequently spawned a whole slew of inferior remakes. Natali’s original still holds up to this day; each individual box holds another ingenious and gruesome trap for our protagonists to navigate. Who will strive to survive, and who will die a painful and often bloody death? You’ll have to watch it to find out. If blood, guts, gore, florescent solutions which bring back the dead and maniacal severed head scientist are your thing, then Re-Animator is the film for you. What Stuart Gordon understands better than most is that sci-fi horror at its core is utterly ridiculous, so he embraces that fact, and has in turn delivered a humorous take on the genre, much like Sam Raimi’s fantastic Evil Dead trilogy. 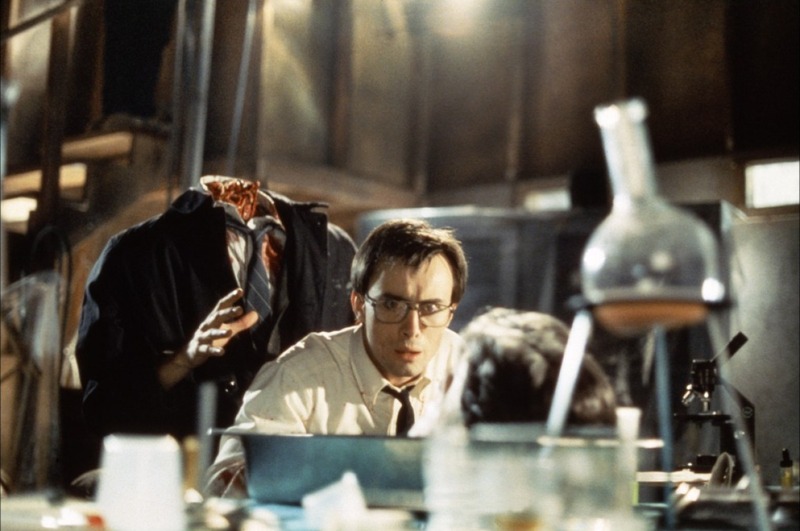 Re-Animator, which is loosely based on H. P. Lovecraft’s episodic novella Herbert West–Reanimator, revolves around the slightly off kilter medical student (he’s basically a mad scientist) Herbert West (Jeffrey Combs) who believes that he has extended the 6 to 12 minute window during which one can bring someone back from the dead. 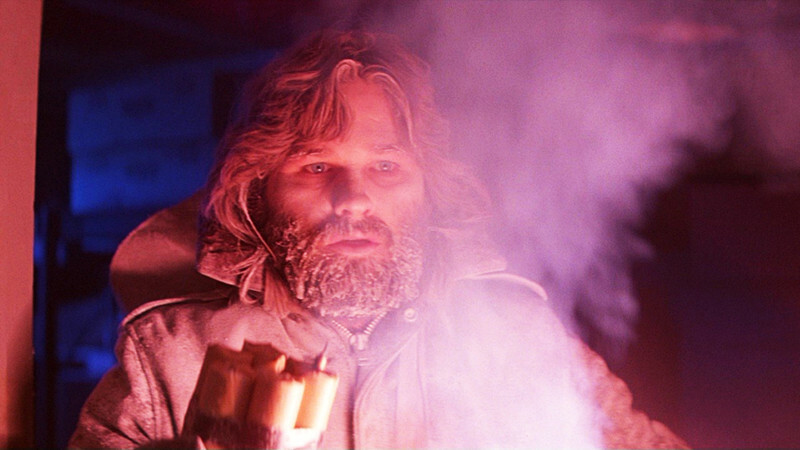 When his rather extreme experiments go wrong in Switzerland, he relocates back to the U.S where he ends up living with fellow medical student, Dan Cain (Bruce Abbot). Things start to take a turn for the bizarre when the university gets wind of West’s experiments, which is when all hell breaks loose, in the form of many ‘re-animated’ bodies. What Stuart Gordon has achieved is simply wonderful. Thanks to its wit, charm and frankly delightful scenes of decapitation, talking heads, incredibly strong and naked reanimated dead bodies, and scenes of complete dismemberment, it’s not hard to understand why the film has such a large cult following. Add to this Jeffrey Combs’ remarkably strange, eerie and insane portrayal of Herbert West, you have the perfect cocktail for a great sci-fi horror farce. You will never trust a doctor to stick a needle in you again, you might end up turning into something that’s not quite ‘you’. When one thinks of David Cronenberg’s The Dead Zone, one may not automatically think it’s a sci-fi horror film; ultimately it’s a drama. Yet anything involving someone waking up from a five-year coma with the ability to see someone’s future has to be classed as science-fiction, and anything involving the traumatising effects that this new ability may entail has to be considered horrific. Cronenberg’s take of Stephen King’s novel of the same name is definitely one of his most straightforward films, certainly in this list. However, that doesn’t make it any worse than anything else he has done. On the contrary, it displays his remarkable ability to direct anything he sets his mind to. Compared to his other films mentioned here, there is a distinct lack of gore, yet he replaces that with a bleak mood, tone and colour palate, which lend themselves perfectly to Stephen King’s original subject material. 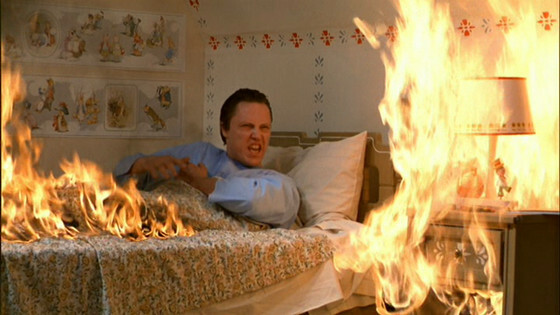 In The Dead Zone Christopher Walken, who is on fine form in this picture, plays Johnny Smith, an English teacher, who’s life is turned upside down when he is severely injured in a car crash. He wakes up from a coma five years later to discover that his girlfriend Sarah (Brooke Adams) has left him, and he possesses strange new psychic abilities, which allow him to see into people’s past, future and even their present, just by touching them. He is eventually roped into solving a nasty case involving someone who enjoys murdering young women. 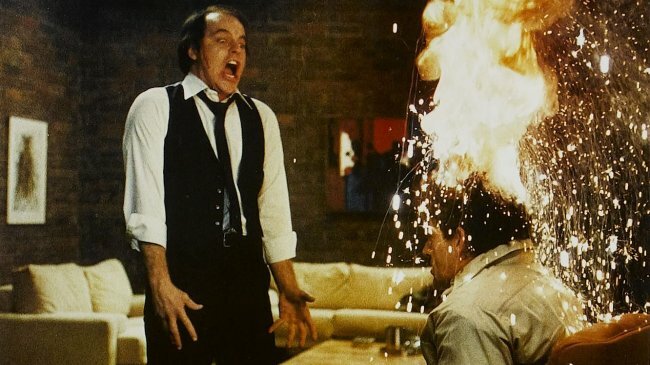 Exploding heads (actually an exploding watermelon), flaming bodies and extraordinary psychic abilities, Scanners is still regarded to be one of the very best sci-fi horror movies of all time. From the sci-fi horror maestro himself, David Cronenberg, Scanners are people with the ability to “scan” other people. This gives them the ability to connect people’s nervous systems, read minds, and even control the bodily functions of others. Some scanners can also control computers, in short, there’s nothing much that scanners can’t do. Therefore, it’s no wonder that ConSec, a purveyor of weaponry and security systems, want to find these gifted individuals to use them for its own purposes. However, Darryl Revok (Michael Ironside), a renegade scanner, decides to wage a war against ConSec. ConSec decide to send out another scanner, Cameron Vale (Steven Lack), to find Revok. Scanners stars Jennifer O’Neill, Steven Lack, Michael Ironside, and Patrick McGoohan, who are all perfect in their respective roles. The interactions between Ironside and Lack are among the film’s best moments. They both have an uncanny ability to captivate the audience, which culminates in a truly masterfully acted, and directed scene between the two of them. Cronenberg understands this genre better than most, and Scanners provides yet more proof of his incredible ability to blend science fiction with horror perfectly to create something truly terrifying. Where Scanners really excels is in Cronenberg’s use of physical special effects. He has an ability to take something mundane, such as a watermelon, and turn it into something which will undoubtedly give you nightmares, such as an exploding head, with bits of brain and blood spattered all over the walls. This particular scene is the film’s “money shot”, and one which has many filmmakers wishing they had come up with it.